Ecuador Gold slot review: find ELK Studios Casinos to play this slot. It seems that cascade slots will have a very eventful year in 2019 because after the Carnival Queen slot of Thunderkick, the Gemtastic slot of Red Tiger Gaming and the Ticket to the Stars slot of Quickspin, ELK Studios has now developed a video slot with the so called Avalanche Reels. 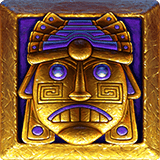 The player is challenged to search for gold in the Temple of Luck that is deep in the rainforest. 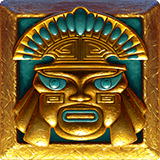 This online video slot has been put in an Aztec-like jacket and has been given the name Ecuador Gold. This ELK Studios slot can be played from February 19, 2019 at virtually every online casino with ELK Studios software. In this article we explain everything about the Ecuador Gold slot. If you do not feel like reading our slot review, you can scroll straight down to find a list of our top accredited ELK Studios Casinos. 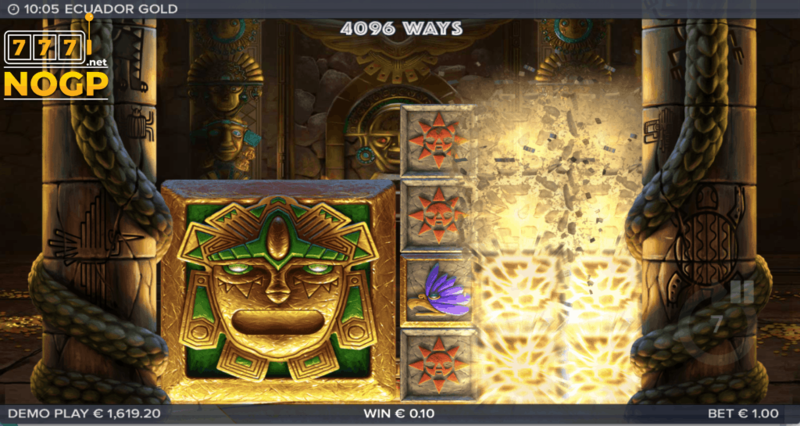 A screenshot of the Ecuador Gold slot where a winning combination has fallen and a big symbol is on the reels. How does the Ecuador Gold video slot work?? Start: four rows and 4096 ways to win. One cascade win: five rows and 15625 ways to win. Two cascade wins: six rows and 46656 ways to win. Three cascade wins: seven rows and 117649 ways to win. Four cascade wins: eight rows and 262114 ways to win. The Ecuador Gold slot is also responsive and can play on any device from at least $/€ 0.20,- per spin and up to $/€ 100, – per spin. The payout percentage is an acceptable 96.14%. The Avalanche feature that we discussed above is not the only feature that this ELK Studios slot has. 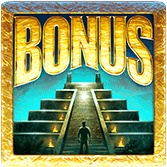 This online slot also has a Big Symbols feature and a Free Drops Bonus feature that we will explain below. 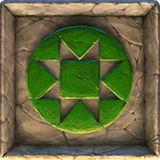 The game also has symbols with different sizes. Symbols of 2×2, 3×3 and 4×4 large can appear on the reels. 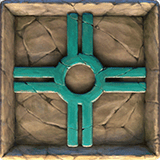 When these symbols fall down, they will destroy all smaller symbols. Ecuador Gold Free Drops feature. 3 Scatter symbols gives you 10 Free Drops. 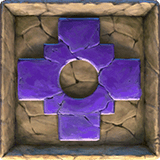 4 Scatter symbols gives you 15 Free Drops. 5 Scatter symbols gives you 20 Free Drops. 6 Scatter symbols gives you 25 Free Drops. Additional Free Drops can be activated during the Free Drops. This is limited to a total of 50. At least one winning combination in one spin will add an extra row. 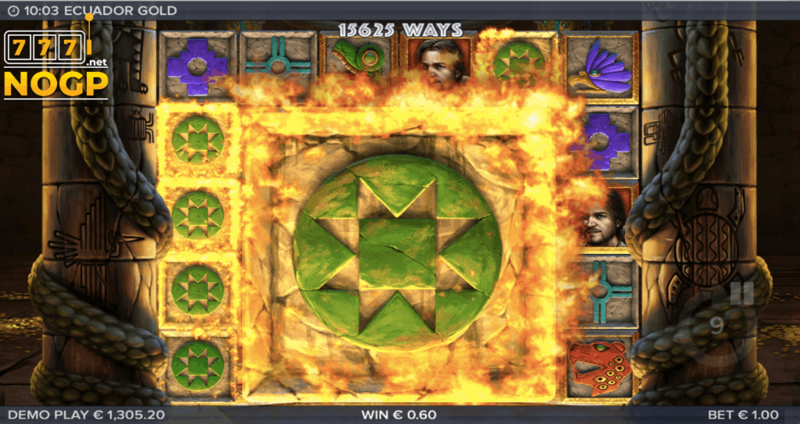 As described above, the playing field can extend to a maximum of six roles, eight rows and 262114 ways to win. 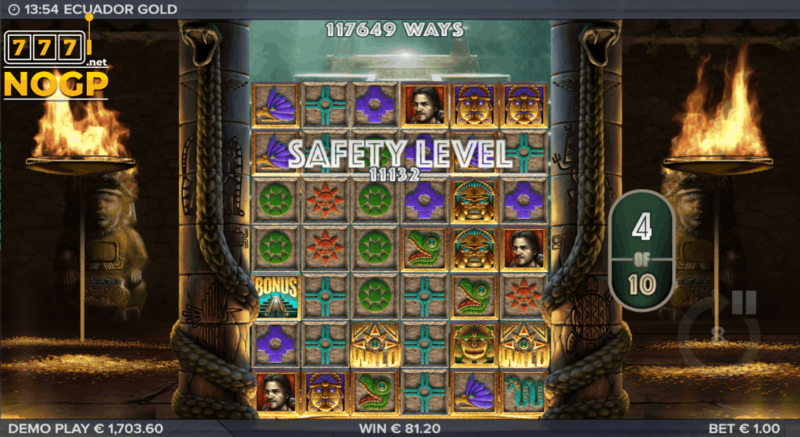 A screenshot of Ecuador Gold’s Free Drop Bonus feature where the maximum playing field of 6 reels and 8 rows has been achieved. 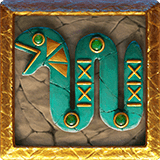 Symbols and symbol value of the Ecuador Gold slot. 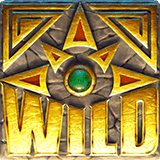 In addition to the Scatter symbol, this ELK Studios slot also has a Wild symbol. 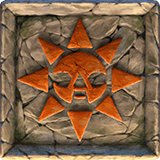 This is the Golden Sun and counts for every other symbol except the Scatter symbol. There is also a Ghosting Wild feature. The Ghosting Wild can only appear on reels three, four, five and six and will move a random number of positions and leave Sticky Wild symbols on the positions where they have been. 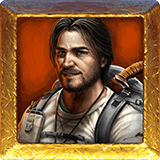 These Sticky Wild symbols will remain during the remaining Free Drops. 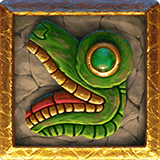 In addition to these symbols, the Ecuador Gold slot also has eleven regular symbols, seven of which have low value symbols consisting of stars, suns, crosses, crocodiles, leopards, snakes and birds. 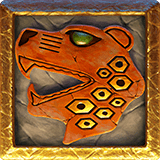 The four high value symbols consist of three masks and Kane – this is the person with whom the player will discover the Temple of Luck -. The values of the symbols can be viewed below. Our Ecuador Gold slot review. ELK Studios starts the year well with this online slot. 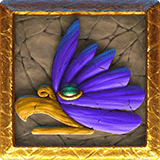 They have already closed very well 2018 with two beautiful video slots namely the Valkyrie slot and The Wiz slot. The Ecuador video slot is again of high quality. This lock is not only graphically beautiful but also the features are perfectly developed. Everything fits together and with this ELK Studios has developed a perfect slot machine that is interesting enough to play on for hours. The maximum that can be won here is 2500 times your bet. The Ecuador Gold slot machine gets 4 out of 5 stars. 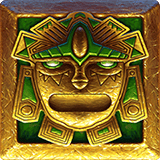 Play the Ecuador Gold slot. The Ecuador Gold slot can be played at every ELK Studios Casino. We recommend doing this at one of our accredited and approved online casinos with the ELK Studios software. This way you can be sure that you are going to gamble at a safe, honest and reliable online casino. We prefer LeoVegas Casino or Mr Play. Want to play somewhere else? Then you will find below our top 10 accredited ELK Studios Casinos.